Dangerous animals, a killer driver's sentence reduction and lost property thefts feature in Northern Ireland's weekly papers. 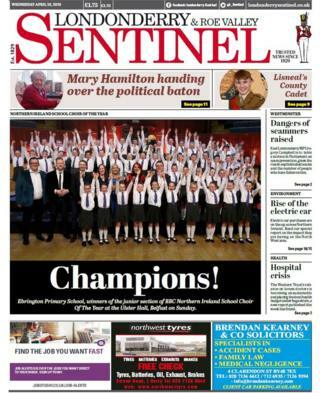 If you're not a fan of snakes, the lead story on the front of the Antrim Guardian may make you a little nervous. The paper reveals that 36 dangerous snakes are legally held under licences across County Antrim. Among them is a saw-scaled viper which, the paper says, is believed to be responsible for more human deaths than all other snake species combined. Other snakes currently privately owned in the county include a green mamba and Indian Cobra. 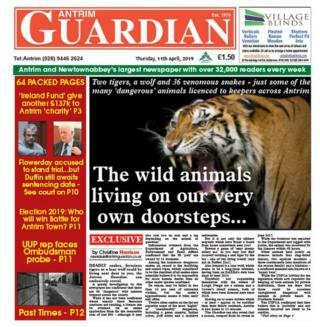 In all, the paper says there are 63 dangerous wild animals licensed across County Antrim, including two tigers, a wolf and two caimans (small crocodiles). The papers also reports on a court case over the theft of an iPhone worth £700 and a smart watch from the lost property section of Belfast International Airport. The woman responsible was given a suspended jail sentence. 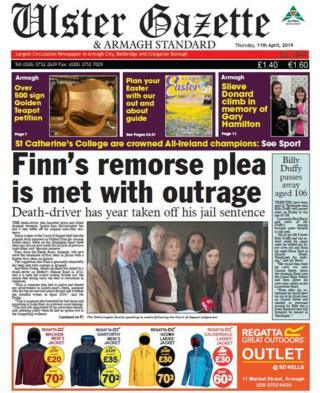 There is outrage after a killer driver had his sentence reduced - that's the front page of the Ulster Gazette. However, his sentence was reduced by a year last week by the Appeal Court. Lesley-Ann's mum, Liz, tells the Gazette she has been devastated by the sentence reduction. "Contrary to what was said, to this day he has never shown any genuine remorse. His regret is entirely self-serving," she says. "Clearly, little value has been placed on the life of our Lesley-Ann." In a separate story, the paper says that several hundred tyres have been found dumped outside Keady. The place where the tyres were found is in a scenic area close to Gentle Owens Lake. 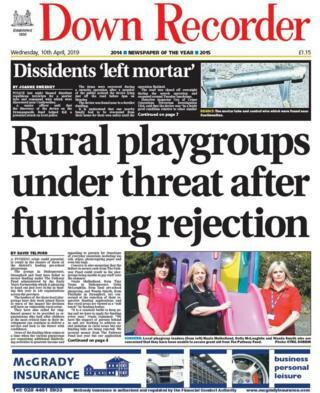 The front of the Down Recorder carries a story about funding concerns for rural playgroups in the county. Parents of young children have been left fretting after pre-school groups in Strangford, Bishopscourt and Saul failed to secure funding through the Pathway Fund. The fund is issued through the Early Years Partnership, which offers grants of up to £30,000 for projects which support education and learning services for children up to the age of four. Delia McLaughlin, from Saul pre-school playgroup, said she believes rural groups suffer most, despite offering the same service as groups in urban areas. "We are working to combat social isolation and the service we deliver helps address that," she said. Meanwhile, the paper reports of funding being provided for a tactile sensory pack for six-year-old Crossgar boy Adam O'Prey-Gordon. His mother, Christine, said charity provided the £1,327 for the pack. "Adam can become extremely anxious at school when his classmates or other pupils are making a noise," she said. "This pack, which has a colourful and visually-arresting panel, really captures his imagination." 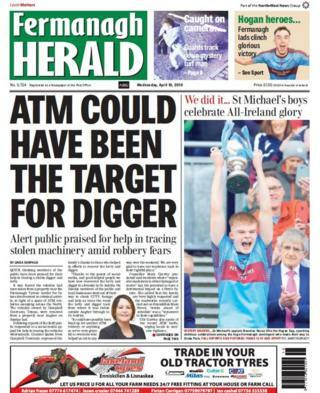 There is praise on the front of the Fermanagh Herald for quick-thinking members of the public for their help in recovering stolen farming equipment. The whereabouts of a stolen digger and lorry, taken from a property near Augher on Sunday, 7 April, were tracked through social media - with speculation the theft could have been part of the recent wave of cash machine robberies. Grainne Quinn, from Campbell Contracts, which owned the equipment, said they were "very glad to have our machines back in their rightful place". "It could have possibly been lined up for another ATM robbery, or anything, so we're very grateful to everyone who helped us out in any way over the weekend," she said. Elsewhere, the paper says the "mystery turf man" caught on CCTV snatching two bales of briquettes from outside a local shop has been tracked down. The theft took place at Rooney's in Belleek on Sunday evening. The paper reports the suspect has been tracked down by gardaí (Irish police) on the other side of the border. Inside the Londonderry Sentinel, a closer look is taken at the rapid increase in electric cars in the Derry and Strabane District Council area. The number of electric cars has gone from 0 in 2011 to 83 this year. The paper says the average distance between charging points in the area is 1.24km - the fourth shortest distance out of all the Northern Ireland council areas. Elsewhere, the paper covers efforts of anglers in Derry to tackle the issue of litter in the waterways. To mark the International Year of the Salmon, Sean McLaughlin from River Faughan Anglers is encouraging his fellow fishermen to help with the clean up. A litter pick last month around the River Faughan resulted in 50 bags of rubbish and plastic being collected. 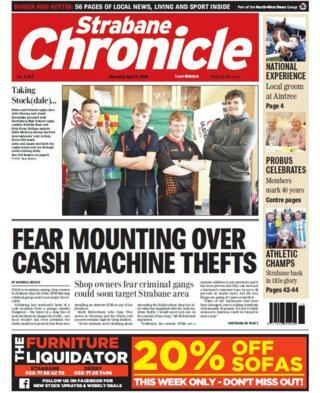 With the weather heating up, the Strabane Chronicle carries a warning about young people swimming in a treacherous stretch of the River Mourne. It comes after a group of boys were seen swimming in the water near Sion weir, an area where 21-year-old Dale Alexander tragically lost his life while swimming in 2009. The paper also covers efforts to preserve an historic tree line running through Sion Mills. A spokesperson for Derry City and Strabane District Council said it was "extremely aware of the iconic nature of the drive through Sino Mills and the benefit of the trees". The spokesperson added permission from landowners was needed for the maintenance of some of the trees.